﻿ PORTWELL ANNOUNCES PEB-2773 3.5" FORM FACTOR EMBEDDED SYSTEM BOARD UTILIZING LATEST GENERATION INTEL® ATOM™ APOLLO LAKE SOC - Portwell, Inc.
Portwell, Inc. (http://www.portwell.com.tw) a world-leading innovator in the Industrial PC (IPC) market and an Associate member of the Intel® Internet of Things (IoT) Solutions Alliance, today announces the release of the PEB-2773 (146mm x 102mm) 3.5" embedded system board based on the Intel® Atom™ processor E3900 series, formerly codenamed Apollo Lake. The new Intel® Atom™ processors integrate the Intel® Gen 9 3D graphics engine with up to 18 EUs (Execution Units) that improves the performance and supports 4K codec encoding/decoding. It also supports one dual-channel 24bit LVDS connection, one DisplayPort (DP) and HDMI on rear I/O with resolution up to 4096x2160. The 204-pin non-ECC SODIMM provides maximum memory, making it capable of supporting up to 8GB of DDR3L. PEB-2773 supports a total of six COM ports, six USB 3.0 ports and dual gigabit Ethernet. 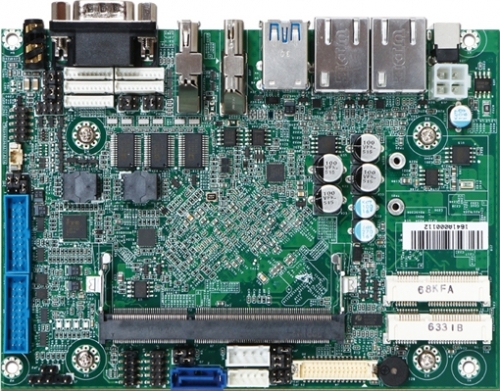 The PEB-2773 represents the latest state-of-the-art innovation that results from the years of experience Portwell has gained as a manufacturer of high-quality computer boards. PEB-2773 build with Intel® Atom™ processor E3900 series. Not only does it operates with TDP under 12W for fan-less applications, but it also supports industrial temperature range from -40°C to 85°C and wide voltage of power input from 12V to 24V. Support for six USB 3.0 ports ensures fast data transmission with low-power consumption and support six com port to allow quick and flexible system expansions. Intel I210-IT Gigabit Ethernet controllers provide dual Gigabit Ethernet LAN access via the two RJ45 ports. PEB-2773 can design their own unique systems for Medical, Networking, Panel PC, Kiosk and Digital Signage applications.